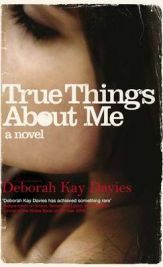 ‘True Things About Me’ is Deborah Kay Davies’ first novel and it is a brilliant debut. Having said that though, it is quite unusual in its style, particularly as the reader never really gets to know who is telling the story – especially by name. We do know that the narrator is a woman; someone who seems to lead a perfectly ordinary life until she meets a man who for some reason causes her to act completely out of character. As her family and friends look on helplessly in dismay, she allows herself to be used and discarded not once but many times. She knows that the man (also not named) is no good for her but she also acknowledges that she can’t help herself when continuing to allow him to mess up her life. It is a disturbing obsessive relationship that seems to be spiralling out of control. This is a story about obsession, lust and violence and how these things can take over everything that you do and make rational people behave in quite insane ways. It is quite scary to see just how this woman changes and behaves in a way that does not make any sense at all. As one reads, one can’t help but wonder whether any one of us might be that weak in those circumstances. This makes it compelling reading as the reader feels like a spectator on the sort of life that would not seem out of place on The Jeremy Kyle Show. It is not car crash viewing but what I would call car crash reading! ‘True Things About Me’ is written extremely well though with a style that is straightforward and honest. In fact the simplicity of the writing makes it quite poignant. The narrator states things exactly as they are and makes no excuses for her behaviour. The description at times is very explicit which might not be to everyone’s taste but it does add to the reader’s understanding of what is happening and how very extreme the relationship is. The book is not very long with just over two hundred pages and I found that I could hardly put it down. I was hooked from the very first page and I just had to keep on reading to find out where it was all leading to and it does keep you guessing until the very end. There are many words that one could use to describe this book – thrilling, disturbing, enigmatic, and compelling – and none would completely do it justice. It is a brilliant book and definitely one that I would recommend. 3 Comments on "True Things About Me"
I agree it was well writen but I really didn’t like the book. I still have to write a review. I kept wondering (more and more as her life took a nose dive) if she really did have a “perfectly ordinary life” before the action in the book. For example, when her co-workers joke about her being a “dark pony” I wonder if that’s based on other past behaviour as well.